The Rural Rambler: USDA Rule Could Protect Producers? USDA Rule Could Protect Producers? fundamentally alter the balance of power in the livestock industry. Supporters of the proposed regulations say the changes will protect livestock producers (ranchers and farmers) from "unfair, fraudulent, or retaliatory practices." Meatpackers have opposed the rule changes and successfully extended the comment period through November 22. The U.S.D.A. is holding a meeting in Fort Collins, CO to hear what people think abot these rules. Ranch and cattle groups, and one labor union, are organizing buses and van pools they hope will bring 25,000 people to Colorado in support of these regulations. It's time for rural advocates to get informed on this issue and consider how it might affect rural communities. 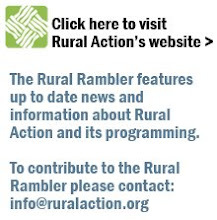 Rural advocates who would like to get involved in this issue have several different opportunities. "New Livestock Rules Could Change Balance of Power"